So excited to try this beer and out of the gate it looks promising with a opaque black appearance and strong head. Aroma is of vending machine hot chocolate, very faint. From here the beer heads down very fast. Taste of sour milk from a metal canteen and virtually no hopfeel on the tongue. My cheapness prevents the drinkability of this one taking a ride out to the town sewer. Can't get over how bad this one is from a brewery that I've had some luck with. It's a huge step forward that craft beer is turning to cans but it's still what is inside that counts and this one fails miserably. Poured from a 12 oz can,into a Cigar City spiegelau IPA glass. Pours a deep brown forming a creamy dark khaki colored head,that stands 1 finger tall.Very nice head retention,and beautiful lacing.Dark brown / deep amber colored body,with distorted light showing through the glass.Very light carbonation. On the nose I get dark roasted malts,and some citrusy tropical fruit hops.Also getting some caramel,and coffee notes. On the palate I get mostly dark roasted malts,coffee,caramel and toffee,balanced with a nice solid piney hop flavor.This is a very nice beer. The body is thin with a moderately dry finish. This is a very nice beer,not sure why it didn't get a higher rating,although I admit I am a sucker for dark beers.This is my first time trying a black IPA,and I definitely look forward to trying more of them. Rich and smooth, 21st Amendment packs the strength of an IPA (6.8% alc./vol. ), all of the bitterness (65 IBU's), and quite a bit of hop flavor and aroma (65 IBU's) into one really nicely balanced, chocolatey/roasty ale. It displays a deep mahogany brown body that appears almost black in the glass beneath a creamy head of khaki. The head holds quite well, and it leaves sheets of spotted and craggy splashed walls of lace behind. The aroma is leafy, citrusy, and floral over a base malt of dark caramel and chocolate. In the mouth it's medium bodied and creamy with a zest of carbonation on the tongue. The flavor delivers a combination of citrusy, floral, grassy, and leafy hops upfront atop a gently roasty and darkly caramelish malt that warms to become more chocolatey across the middle. The hops also become a bit more spicy. It finishes with a drop of dark milk chocolate rising, but that's then quickly dried as the hops become more spicy and piney. As to drinkability, I think it's quite accessible. If you've enjoyed a strong porter and you enjoy hops, this has got you covered. It could probably be more focused, but it's still very nicely done. "Because eveyone likes it in the can. Tasty cracked cans." as Niko likes to say. Another one from 21st A, which I've loved most of their beers so far. Here's another in the pipeline. A: Wow, with a can I'm forced to pour somewhat aggressively and it comes out with a huge head that forces me to stop pouring, with a 50% head to beer ratio, which is fluffy and bubbly and fades semi slowly with a lot of lacing. The beer is a very dark brown, dark raisin brown with hints of light coming through around the edges showing that is it potentially clear. N: An interesting blend of malts and hops. It has an earthy bitter hop aroma, more like an English bitter almost but adds the American spicy and piny hop aromas with that. There is also a darker malty aroma, with some crystal malts and slight chewy malt aspect. T: Taste comes on just as strong, with lots of varying flavors. It actually starts with a slight citrus flavor, juicy hops and even juicy malts. Some darker malts and chewy malts line the backbone, with a slight sweetness and even a little sugary flavor. There is a nice bitterness that doesn't overpower, just adds the nice hit. Some spicy and earthy hops make their presence known, but not as much as the aroma. A slight caramel malt flavor starts to shine through later on the taste. M: Medium body, slightly creamy too (creamy, really? ), with tons of carbonation. F: Still pretty bitter as it finishes. Some grassy hops come out at this point, and bring more slight citrus and pine but very light. A slight sticky syrupy finish but no real sweetness as it dries to a somewhat dry finish. Some lingering earthy and spicy hop pellet flavors, with late hop addition flavors. Not bad for a black IPA, doesn't go overboard in any category, and is pretty clean and tasty. Going on trips with this would be great, cause taking it in the can always works better. The dark, reddish brown, liquid pours out into a nonic pint glass with a 1/2" light tan head. Leaving lots of thick rings of foam as the beer is consumed. Sipping creates some arches of leggy lacing and lots of small specks of lacing. The aromas are filled with both pine and dark roasted malt that brings a bit of coffee. The flavors are much as expected from the nose with the roasted malt up front and with the coffee and the piney hops in the background. The mouthfeel is medium bodied and slightly crisp with the fine moderate carbonation. The moderately long finish begins as the roasted malt and coffee begin to fade, followed by the piney hops. The residual dry ending seems slightly burnt and dry. On the whole this is a well made beer that I mostly have enjoyed. My major reservation is that the final dry ending seems more bitter from the slightly burnt character than from the hop bitterness. I'd also prefer a bit more citric character. So I'll probably not be buying more. A- Pours a deep, opaque Brown with a beige head that's thick as cotton and doesn't fade with time. Honestly looks more like a porter than an IOS. T- Like a dry chocolate milk. Mild malty sweetness sits behind the strongly bitter hop presence, with maybe some roasted malt adding a stout-like quality. O- It's honestly more helpful to think of this beer as a dry-hopped stout than a "black IPA" (oxymoron). Still one of my favorites to grab if I'm in the mood for something a little weird. L: very dark brown pour with ample active 3 fingered head. Settled down to a thicker tan head. Lingering beige lacing on glass. F: heavier side of medium. Good carbonation. Overall agree that this one leans towards a porter.... Regardless of what style you want to pick this is a great tasting beer. Picked up a 6-pack of this tonight along with a 6-pack is Sam Adams 76. I must say of the 2 I like this one a whole lot better. Not sure f the color rating because I drank it right out of the can...glasses, describing how many fingers the head is and how long it lasts and all the garbage are for beer snobs...not beer swillers like myself. Overall, it was a bit shocking as I felt like I was drinking a heavier beer but with a nice amount of hops and in the end I didn’t feel like I needed a nap...I dig that! I would recommend trying this if you want to get out of the proverbial box, but then again I like Miller lite too...eat my shorts beer hypsters! Dark brown with little light passing through with off white head. It resembles a cola. Smell is citrus hops with a light roasted malt. Not very aromatic. Taste is citrus and floral hop profile with an addition of burnt malt. Mouthfeel is thin and crisp. Slightly bitter. Good drinkability. A decent black ipa. 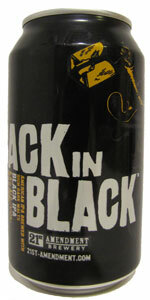 Can't really beat the jet black look of this beer - it looks like a stout, and definitely lives up to its name. Head is think and tan with nice lacing that lingers. Nose doesn't have the roast that it looks like it would have - it smells like your average IPA with floral hoppiness. Taste has an interesting mix of earthy hops and smoky malts - a good balance, but lacking in anything that really stands out. Medium body is ideal for this beer, nice and smooth without too much lingering aftertaste. Overall a good beer for the style, but maybe lacks something that stands out. Canned 10/25/11. Poured into a Sierra Nevada Celebration Ale tumbler. A: Sure this was dark, but I got a hint of ruby around the edges when I held it up to a light source. Stupid saying of the month: "If the beer weren't black, I would be able to see right through it". The extremely dense head looked liked cappuccino whipped cream. S: The pineapple flair is definitely strong with this one. Additionally, I got some dark malts as well. This was almost a black and tan with about 2/3 IPA, and the rest smoked porter. T: This was very smooth and the IPA-ness that I got on the nose got lost to the roast. But that's okay by me though. This was almost sort of a weak "Storm King" or something in that vain - Strong malt core with fruity, hoppy characteristics. M: The lacing on this one resembled melted and cooled marshmallow creme on top of hot chocolate. Highly drinkable, with slightly prickly carbonation, and only a touch of bitterness on the end. O: I think the reason that the scores are so low on this one is due to it's malt heaviness as opposed to its puny hop zing. Lighten up peeps! A- Pours a not-quite-black deep brown body with reddish hues. A nice 2-finger tan head that falls relatively quickly to a nice thick cap. It leaves some really nice lacing. S- Chocolate up front, espresso, coffee, caramel malts, and slight citrus hops. T- Hops play a more up front role in the taste than in the aroma. But, still, mostly chocoloate and caramel malts are the big players here. MF- Almost a full body with a good amount of carbonation.